1. Wash and sort beans. 2. 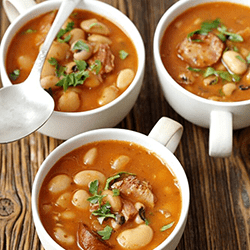 For each pound of beans, add 6 cups of water in a 5-qt casserole along with any seasonings called for in the recipe. 3. Microwave at full power for 8-10 minutes or until boiling. 4. Cover with plastic wrap and/or casserole lid. Let stand 1 hour. 5. Stir several times and add hot water as needed to keep beans covered. 6. Cook at full power for 8-10 minutes or until boiling; reduce power level to 50% and cook another 15-20 minutes or until tender. * Beans may also be soaked overnight and then cooked at full power for 15-20 minutes or until tender. NOTE: Wattage and cooking temperatures of microwaves vary. Always consult the recipes and temperature directions developed for your microwave by the manufacturer.